your own logo on your clothing? we can take care of that for you! 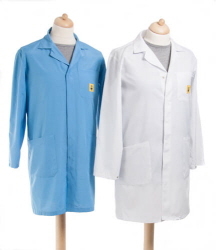 The lab-coats sold the best in 3/4-length! * With 2 side pockets and breast pocket with ESD logo. * Light weight (156g/m2) and washable. * 65% polyester / 32% cotton / 3% Carbon fibre.